The vegetation of the region was studied and mapped as part of the Arctic Long-Term Ecological Research (LTER) project at Toolik Lake and the Department of Energy R4D (Response, Resistance, Resilience and Recovery of vegetation from Disturbance) project at Imnavait Creek (Walker et al. 1994, Walker and Walker 1996). 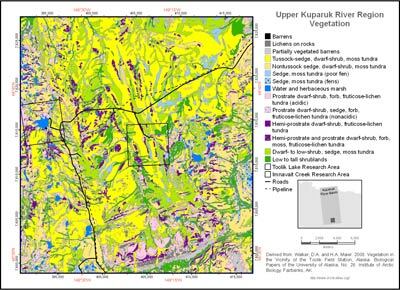 Fifty-seven plant communities and land-cover types were recognized during the mapping of the upper Kuparuk River region and are designated by the numeric GIS codes in the second column of the legend. These were grouped into the 14 physiognomic map units shown on Map A, which are compatible with the Circumpolar Arctic Vegetation Map (CAVM Team 2003) and the Alaska Arctic Tundra Vegetation Map (Raynolds et al. 2005, Raynolds et al. 2006). Barren roads, gravel construction pads, airstrips and gravel mines. Lichen communities on rocks, including Cetraria nigricans-Rhizocarpon geographicum (12). Complexes of vegetation with rock or soil on scree slopes (11), river gravels and other barrens (14), partially vegetated alpine areas (13) and areas dominated by nonsorted circles (15). Dominant plant communities include: Saxifraga oppositifolia-Saxifraga eschscholtzii (131); Epilobium latifolium-Castilleja caudata (141); revegetated gravel pads with Festuca rubra (142); Anthelia juratzkana-Juncus biglumis (15). 4. Tussock-sedge, dwarf-shrub, moss tundra. Moist acidic tussock-tundra complexes dominated by graminoids (31, 311). Dominant plant communities include Eriophorum vaginatum-Sphagnum (31) and Carex bigelowii-Sphagnum (3111). Mesic to subhygric, stable, acidic (pH < 5.5) sites with shallow to moderate snow. Flat areas and gentle slopes. 5. Nontussock-sedge, dwarf-shrub, moss tundra. Moist nonacidic tundra complexes (32). Dominant plant communities include: Carex bigelowii-Dryas integrifolia (321), Carex bigelowii-Dryas integrifolia (subtypes Equisetum arvense (322) and Salix glauca (324)), Eriophorum vaginatum-Tomentypnum nitens (323) and Carex bigelowii-Sphagnum, subtype Cassiope tetragona (3113). Also includes a few other graminoid-dominated communities, including: Festuca altaica-Poa glauca (disturbed thermokarst areas) (325), Deschampsia caespitosa-Carex saxatilis (drained lakes) (326), Carex podocarpa-Salix chamissonis (snowy streamsides) (515). Mesic to subhygric, nonacidic (pH > 5.5) sites with shallow to moderate snow. Flat areas and gentle slopes. Also miscellaneous graminoid-dominated sites including deep-snow stream margins, landslides and some rocky drained-lake basins. 6. Sedge-moss tundra (poor fens). Lower microsites: Eriophorum scheuchzeri-Sphagnum orientale (412) and Eriophorum angustifolium-Sphagnum (413). Raised microsites: Sphagnum lenense-Salix fuscescens (411). Subhydric to hydric, acidic (pH < 4.5). Poor fens, meadows in colluvial basins. Lower microsites: Carex aquatilis-Carex chordorrhiza (422) and Eriophorum angustifolium-Carex aquatilis (423). Raised microsites: Trichophorum caespitosum-Tomentypnum nitens (421) and Carex bigelowii-Tomentypnum nitens. Subhydric to hydric, nonacidic (pH > 4.5). Water tracks, stream margins, fens, flarks on solifuluction slopes. 8. Water and herbaceous marsh. Unvegetated water (6) and/or aquatic vegetation in lakes and streams. Dominant plant communities include: Arctophila fulva-Hippuris vulgaris and Sparganium hyperboreum-Hippuris vulgaris (43). Hydric. Lakes, ponds and streams. 9. Prostrate dwarf-shrub, forb, fruticose-lichen tundra (acidic). Dry acidic tundra complexes (21). Dominant plant communities include: Dryas octopetala-Selaginella sibirica (211), Arctous alpina-Salix phlebophylla (212); and lichen tundra Cladonia arbuscula-Stereocaulon tomentosum (215). Xeric to xeromesic, acidic, wind blown to shallow winter snow cover. Ridge tops, exposed slopes, dry river terraces. 10. Prostrate dwarf-shrub, sedge, forb, fruticose-lichen tundra (nonacidic). Dry nonacidic tundra complexes. Dryas integrifolia-Oxytropis nigrescens (24) and Dryas integrifolia-Astragalus umbellatus (22). Xeromesic to mesic, nonacidic. Includes a wide variety of drier nonacidic habitats, including stable river terraces and nonsorted stripes on slopes. 11. Hemi-prostrate dwarf-shrub, fruticose-lichen tundra. Deeper snowbed complexes (23). Dominant plant communities include: Cassiope tetragona-Carex microchaeta (231), Cassiope tetragona-Dryas integrifolia (232); and Salix rotundifolia-Sanionia uncinatus (233). Subxeric to mesic, acidic to nonacidic, with deep snow. Snowbeds. 12. Hemi-prostrate and prostrate dwarf-shrub, forb, moss, fruticose-lichen tundra. Dry tundra with shallow snowbeds mainly on stripe complexes. Dominant plant communities include: Cassiope tetragona-Calamagrostis inexpansa (214). Also includes dry areas with hemi-prostrate dwarf birch Betula nana-Hierochloe alpina (213). Subxeric to mesic, acidic to nonacidic, somewhat-deeper-snow areas. Depressions on acidic ridge crests, dry glacial till and outwash; nonsorted stripes. 13. Dwarf- to low-shrub, sedge, moss tundra. Moist acidic tundra complexes dominated by shrubs. Includes shrubby tussock tundra and mainly dwarf-shrub tundra areas (3112). Dominant plant communities include: Betula nana-Eriophorum vaginatum (312) and Salix pulchra-Carex bigelowii (no code). Also acidic shrub tundra dominated by dwarf birch or willows. Dominant plant communities include: Betula nana-Rubus chamaemorus and Salix pulchra-Sphagnum (513). Mesic to subhygric, moderate snow. Includes a wide variety of habitats with dwarf shrubs, including wet lower slopes, margins of upland water tracks, palsas and high-centered polygons. 14. Low to tall shrublands. 1. Shrublands along streams and water tracks dominated by diamond-leaf willow (Salix pulchra). Dominant plant communities include: Salix pulchra-Eriophorum angustifolium (511) and Salix pulchra-Calamagrostis canadensis (514). 2. Shrublands in riparian complexes (51) dominated by feltleaf willow (S. alaxensis) and lanate willow (S. richardsonii) (512); includes tall shrublands (5121) and low shrublands (5122). 3. Upland shrublands dominated by glaucous willow (Salix glauca) or alder (Alnus crispa) (52). Mesic to subhydric, often with deep snow. Stream margins, upland water tracks and south-facing slopes.